HAYWOOD COUNTY, N.C. -- Author Charles Frazier, a native son of these parts, had his widely acclaimed novel "Cold Mountain," winner of the National Book Award, adapted into a 2003 movie release by the same name. 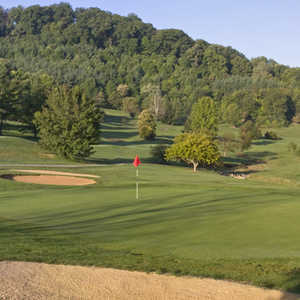 Waynesville Country Club & Inn: The granddaddy of golfing opportunities in Haywood County. If you have neither seen nor read the story, a deserting Confederate soldier, played on the screen by Jude Law, makes a perilous return trek to Cold Mountain after being wounded at the Battle of Petersburg, Va. He makes it back to reunite with his true love, Ada, portrayed in the movie by the leggy Nicole Kidman. The real-life Cold Mountain that inspired Frazier's writing is a 6,030-foot peak in the Pisgah National Forest in the southern end of this county. Never mind that Hollywood took the book's local flavor to the Carpathian Mountains of Romania for filming. In my proposed sequel to the movie -- fast forward 140 years or so to today -- Law is a single-digit handicapper with a bothersome back, too upright a stance and a lead foot. He lands a speeding ticket for exceeding 45 mph on the Blue Ridge Parkway while hightailing it in from the Biltmore Estate in Asheville, not wanting to be late for a tee time with his scramble partner, Kidman, at Springdale Country Club, situated in the shadow of Cold Mountain. Okay, the storyline for "Cold Mountain II" is a spurious stretch. 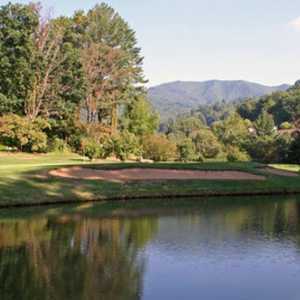 But Haywood County is a breathtaking locale in the clutches of both the Blue Ridge and Great Smoky mountains that is the perfect setting for a Civil War-era romantic narrative and a modern-day golf escape. Encompassing the towns of Waynesville, Maggie Valley, Canton, Clyde and Lake Junaluska, Haywood County is tucked in the southwestern corner of the Tar Heel state. It is easily accessible from Asheville via Interstate 40 and the Great Smoky Mountains Expressway. It also attracts a fair share of weekend travelers and vacationers from the metropolises of Atlanta, Charlotte and Knoxville -- all within easy non-stop driving distance. This is your destination if affordable and scenic mountain golf is your agenda. And if you are one who can tear yourself away from the golf links for parts of a day, there are other pursuits. The Blue Ridge Parkway, Great Smoky Mountains National Park, Appalachian Trail and Cherokee Indian Reservation (including Harrah's Cherokee Casino) are all at your disposal. The 250-room Biltmore Estate in Asheville and the Great Smoky Mountains Railroad are other nearby and recommended diversions. 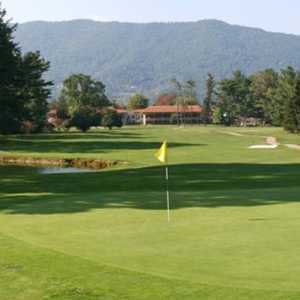 There are six publicly accessible golf courses in Haywood County: Maggie Valley Resort & Country Club, Waynesville Country Club & Inn, Springdale Country Club, Lake Junaluska Golf Course, Iron Tree Golf Course and the semi-private Laurel Ridge Country Club. If you don't think golf is taken seriously in this mountainous environment, evidence to the contrary is a self-serve, 24-hour driving range that can be found near Lake Junaluska, home of the Lake Junaluska United Methodist Conference & Retreat Center. Make sure you have the proper bills in your wallet for the golf ball dispenser if you choose to work on your wedge shots in solace at 3 a.m. If you don't have the requisite five dollars in the wee hours, all is not lost: A hastily made sign at the range directs you to the change machine at the do-it-yourself car wash down the block. Waynesville is the granddaddy of golfing opportunities in Haywood County. The first nine holes were laid out in 1926 on the site of an old dairy farm. The green fees at the time, all of 50 cents, were left in a cigar box. Waynesville now boasts 27 holes with separate nines named Carolina, Dogwood and Blue Ridge. All three play to par 35. Compared to some of the brutally challenging golf courses that have recently been built within an hour's drive of here, Waynesville is a welcomed relief. There are no 100 foot vertical drops from tee boxes that make you feel more like a bombardier than a golfer. The longest of the nine-hole layouts plays to less than 3,000 yards from the rear tees. It is a straightforward, WYSIWYG (what you see is what you get, for non-geeks) course. If your game is on, and you're not distracted by the gorgeous mountainous landscape, you should score well here. Your ride around the course will definitely be comfortable, regardless of how you're playing. Waynesville imports a new fleet of golf carts every year. Waynesville Country Club & Inn has an array of comfortable accommodations, including the Inn, fairway cottages and country villas. The best advice on playing Maggie Valley's golf course is to get your game in sync on the front nine, particularly your putting stroke. The opening nine are in the valley lowlands and relatively benign. But gird your loins at the turn after gobbling down a dog at the grill. As the course climbs into the surrounding hills on the back nine, it is time to concentrate on not letting your scores make the same ascent. No. 10 is the no. 1 handicapped hole and they don't get a whole lot easier after that. Flat putting surfaces come to an end. The slope of the greens on some of the home holes, Nos. 11, 13 and 16, in particular, rival those you can slalom down at the Cataloochee Ski Resort on the other end of town. Yes, an overstatement, but three- and even four-putts are waiting to happen if you get loose with your stroke. Springdale Country Club is located on Hwy. 276 outside of Waynesville and Canton. Standing on the sixth green of this layout, you can get a spectacular view of Cold Mountain. Dining and overnight accommodations are available on site. The course relishes the difficulty of its fourth hole, an uphill 429-yard par 4. It has earned the moniker the "Springdale Spasm" because that's what your sacroiliac is likely to do if you try to muscle your way through the challenge. There is a smorgasbord of activities to partake of in this area. It would take a 48-page brochure by the Haywood County Tourism Development Authority to cover them all. In fact, one can be ordered online for free at www.smokeymountains.net. Make sure you pull yourself away from your clubs to visit downtown Waynesville, N.C. It is a revitalized and bustling area that features restaurants, art galleries and gift shops up and down Main St. A must see is Mast General Store -- even if just to hear the hardwood floors creak under your feet. At this old-time mercantile shop you can buy everything from rock candy to bird baths to top-of-the-line hiking and camping equipment. Also in downtown, step inside Whitman's Bakery and you'll swear off the Adkins Diet forever in favor of the homemade sweet rolls. In Maggie Valley, transportation buffs should visit the Wheels Through Time Museum. The 38,000-square foot exhibit features a world-class collection of more than 250 vintage automobiles and motorcycles. Maggie Valley's main drag, Soco Rd., offers an array of shops and antiquing opportunities. Folk festivals, clogging and banjo-picking shows are regularly available in this Appalachian region where you will still find side streets with colloquial names like Way Up Yonder Rd. and Walnut Holler Way. For upscale dining with tablecloths, candlelight and a bottle of fine wine, make sure to try The Old Stone Inn in Waynesville. Its fare, featuring specialties such as the Escalopes of Pork Tenderloin with Rosemary and Peanut Butter Mousse Pie, has earned the Inn a Golden Fork Award from the Gourmet Diners' Society of North America every year since 1998. The proprietors, Robert and Cindy Zinser, can also discuss golf with a passion. Also in Waynesville, try O'Malley's Irish Pub on Main St., Maggie's Galley for seafood, Angelo's for pizza, SocoMoon Tea House & Emporium for sandwiches and Wildfire for an eclectic menu. Your best opportunities in Maggie Valley are J. Arthur's for fine dining and Saratoga's bar and grill. Patrick Jones was the senior producer for ESPN's "Lower Your Score with Tom Kite" CD-ROM instructional golf training series. He spent six years as a full-time sports writer and was awarded first-place honors for column writing from both the Florida and Texas sports writers associations.